Aladdin is a 1992 American animated musical fantasy movie. It was produced by Walt Disney Feature Animation and released by Walt Disney Pictures. Aladdin is the 31st animated movie in the Walt Disney Animated Classics series. It was part of the Disney movie era known as the Disney Renaissance. The movie was directed by John Musker and Ron Clements. It is based on the Arab folktale of Aladdin and the magic lamp from One Thousand and One Nights. The voice cast features Scott Weinger, Jonathan Freeman, Robin Williams, Linda Larkin, Frank Welker, Gilbert Gottfried, and Douglas Seale. 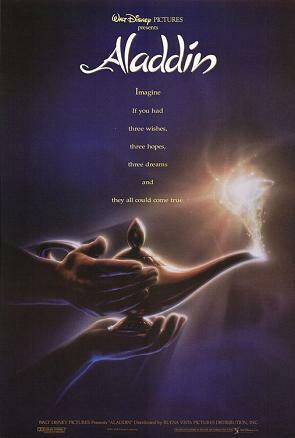 Aladdin was released on November 25, 1992. It got positive reviews and was the most successful movie of 1992, earning over $217 million in revenue in the United States, and over $504 million worldwide. The movie also won many awards, most of them for its soundtrack. Aladdin's success led to other material inspired by the movie, including two direct-to-video sequels, The Return of Jafar and Aladdin and the King of Thieves; an animated television series; toys, video games, spin-offs, and Disney merchandise. A Broadway adaptation debuted in 2014. The movie opens on a fictional Arabian kingdom named Agrabah where a scandal happens: the Sultan wants his daughter Jasmine to get married but she refuses all suitors and escapes from the palace. In the marketplace, she meets a poor boy of the streets named Aladdin. Meanwhile, at the palace's high tower, the evil wizard Jafar discovers that Aladdin is the man that can help him to find a magic lamp. Jafar sends the royals guards to arrest Aladdin. In the dungeon, Jafar tells Aladdin to enter the Cave of Wonders to get a lamp. Aladdin and his pet monkey Abu enter the cave and find mountains of gold, jewels and a magic carpet. After being told not to touch anything but the lamp, Abu tries to steal a forbidden treasure and the cave destroys itself. When Aladdin tries to clean the lamp, Genie escapes and offers Aladdin three wishes. Aladdin agrees and first wishes to become a prince, thus letting him marry Princess Jasmine. With much celebration, Aladdin travels to the palace and announces to the Sultan that he wishes to marry the princess. That night, Aladdin and Jasmine fly on the magic carpet and they fall in love. The next morning, Jasmine announces to the whole kingdom that she had chosen a suiter. After hearing the news, Jafar, whose plan was to marry Jasmine and become Sultan, steals the lamp from Aladdin and uses his first wish to become the Sultan. The new evil Sultan reveals Aladdin's true character, the average "streetrat", and sends him to the end of the earth. He then makes Jasmine and the former Sultan his servants and tells the genie to construct his palace. Aladdin escapes the ends of the earth and returns to the palace to rescue Jasmine and defeat Jafar. When she sees Aladdin approaching, Jasmine distracts Jafar by pretending to fall in love with him. The plan fails when Jafar sees Aladdin's reflection in Jasmine's tiara and attacks him. When Jafar boasts that he is the "most powerful sorcerer in the world", Aladdin argues that a genie has more power. Upset by this fact, Jafar uses his last wish to become an all-powerful genie. Aladdin reminds Jafar of everything involved in being a genie, and Jafar is confined to the lamp, unable to use his power. The lamp is sent back to the Cave of Wonders, to ensure that Jafar never escapes. Agrabah is put back under the old Sultan, whose first change is a new law that a princess can marry a common man, not only another royal figure. Jasmine is free to marry Aladdin. At the end of the movie, Aladdin wishes Genie free, as he had promised in the beginning. Bruce Adler as the singing voice of the Merchant. The Magic Carpet is a sentient carpet who is able to fly. Hal Smith has a small, uncredited role for doing the sounds of Jafar's horse, as he did Philippe in Beauty and the Beast. Aladdin (1992 movie) Facts for Kids. Kiddle Encyclopedia.